The beautiful station from the inside; the attraction is the authentic brickwork architecture authentic to the period it was built. The iconic signage at the station. 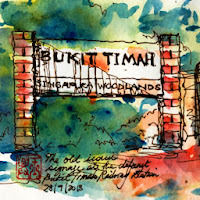 Bukit Timah Railway Station was a railway station (now a conserved recreational building) and crossing loop in Singapore, owned by Keretapi Tanah Melayu (KTM), the main railway operator in Malaysia. It opened on the dismantled Tank Road mainline in 1903, was rebuilt on the current Singapore–Johor Bahru KTM Intercity mainline in 1932, until the Jurong Line shut down and it was a crossing loop station in the late 1940s until closure. The station was a freight interchange for the now defunct Jurong Line from 1965 to the early 1990s. On 1 July 2011 the line closed following a historic land-swap agreement between the Singapore and Malaysia governments which saw rail service between Woodlands and Tanjong Pagar cease. I have not been to this station before this, but I remember my experience with the train service that ran along this track. As an Interior Architecture student, my class was once tasked to redesign and remodel the Eastern and Oriental Express. We were required to design everything from the cabins, the drapes, the curtains and right down to the teaspoons used in the dining cars. As part of our research efforts, a bunch of us took the train to the Federation up north. To fully immerse in the experience, some even booked first class tickets in the sleeper cars and journeyed in an all-nighter, all the way to the capital, Kuala Lumpur. The station is now defunct, of course. But when I walked around the station while sketching the place, I could almost imagine the station when it was first commissioned: people waiting at the station's seating parlour, with their luggage, anticipating the arrival of the train. It's the train that will bring them closer to their destination, to their home, to their loved ones, to their adventure, to their lives... beautiful, romantic and in sepia-toned black-and-white.